Posted on 4, November 2016 by EuropaWire PR Editors | This entry was posted in Aviation & Aerospace, Environment, Germany, Society and tagged 25th anniversary of Crane Protection Germany, Dr. Günter Nowald, Lufthansa, Susanne Kotysch, “Wismar” aircraft. Bookmark the permalink. To celebrate the 25th anniversary of Crane Protection Germany, the Lufthansa Group has a very special present for all friends of the crane – their aircraft “Wismar” will be taking off with a special design from this week. The Airbus A321-100 with the registration D-AIRR flies all across Europe and will be decorated with a stylized crane design for six months. These are the same birds which have already been used to decorate the new transport vehicle of Crane Protection Germany. The “Wismar” will be sporting her new outfit until next spring, when the majestic birds can be spotted once more in skies across Europe as they leave their winter quarters and fly back to northern regions again. “We are really delighted with this special present to celebrate the 25th anniversary of our extremely successful partnership. Even though we have already achieved a lot for crane protection in our work together, there is still a lot more to do. At least ten of the 15 crane species known world-wide are under threat as the destruction of their breeding grounds and their resting and gathering sites continues. This loss of habitat also applies to those cranes living in Germany, even though they are not currently on the endangered list. To address this, we need to raise awareness and gain the necessary support”, says Dr. Günter Nowald, Head of the Crane Information Centre and CEO of Crane Protection Germany gGmbH, based in Groß Mohrdorf in Mecklenburg-Vorpommern. “The Lufthansa Group has been supporting Crane Protection since the 1980s. Our goal has always been to support the protection of the species. As the city is in close proximity to the resting grounds of the cranes, we have made a conscious decision when choosing “Wismar”, an aircraft from north Germany”, says Susanne Kotysch, Head of Corporate Responsibility & Event Management, Lufthansa Group. After the reunification, the East and West German crane protection groups founded the working group Crane Protection Germany in partnership with Lufthansa. 25 years ago in February 1991, the formation of the non-profit Crane Protection Germany GmbH followed with NABU (Protection of Nature, Germany) and WWF (Worldwide Fund for Nature) as partners. In its latest investment, the Lufthansa Group is sponsoring the new observation platform KRANORAMA at the Günzer Lake. This platform offers barrier-free access to a crane feeding area for the first time with a live broadcast of the cranes via monitor, which guarantees a close-up experience of the birds, which can be up to 1.2m tall. Information on the resting and migration of the cranes is presented via additional audio-visual media and is constantly updated. 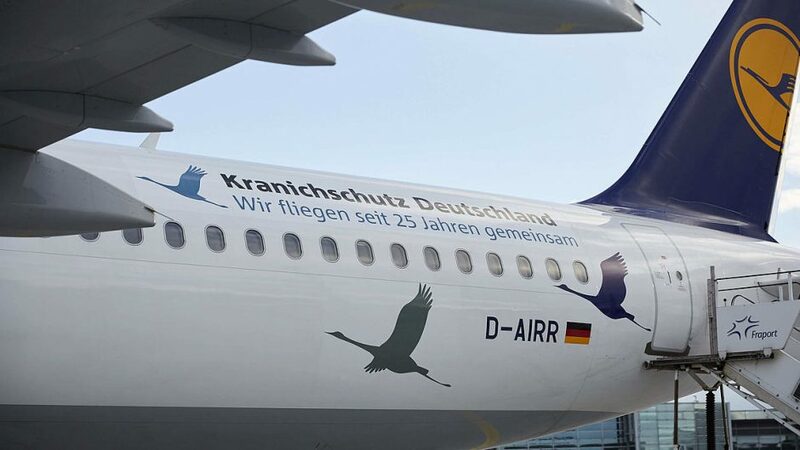 Now bird watchers and plane spotters across the whole of Europe will be delighted to see another special “bird” in the skies and at airports – the anniversary plane to celebrate 25 years of Crane Protection Germany.